When Levi S. McCabe died in 1915 at the age of 79, our entire city mourned the death of this tireless booster. McCabe’s department store employees marched en masse from the store to Broadway Presbyterian Church for the services. All the other downtown stores closed in respect during the funeral. Mr. McCabe was born in New York state and came to this area in 1868. After teaching school for two years, he and his brother opened a drygoods business that eventually resulted in the McCabe name on one or more downtown stores until not too many years ago. But L. S. McCabe had many interests in addition to retailing. He owned farms in rural Iowa and Illinois where he raised cattle and pigs. He was a real estate developer and subdivider. He owned downtown’s Colonial hotel on Third Avenue and 18th Street, now demolished. He was President of the Safety Deposit Company, owner of the Safety Building. He was involved in the Moline Central Street Railway, and later, the Tri City Railway. And — the explanation for our postcard’s caption — he served a four-year term in the Illinois state senate starting in 1902. 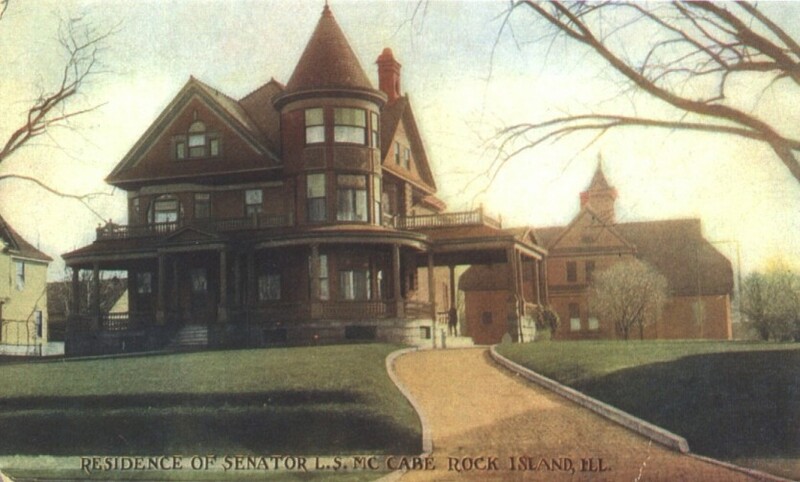 This, the residence of Senator L. S. McCabe, was located at 2920 Fifth Avenue. The McCabe family purchased the home from the estate of Mrs. Telitha Munro, the widow of John Munro, in the early 1900s. John Munro, who listed his occupation simply as “blacksmith,” had hired local architect George Stauduhar to design the house. It had reportedly cost $35,000. The plans, which are in the University of Illinois Archives, are dated 1896. 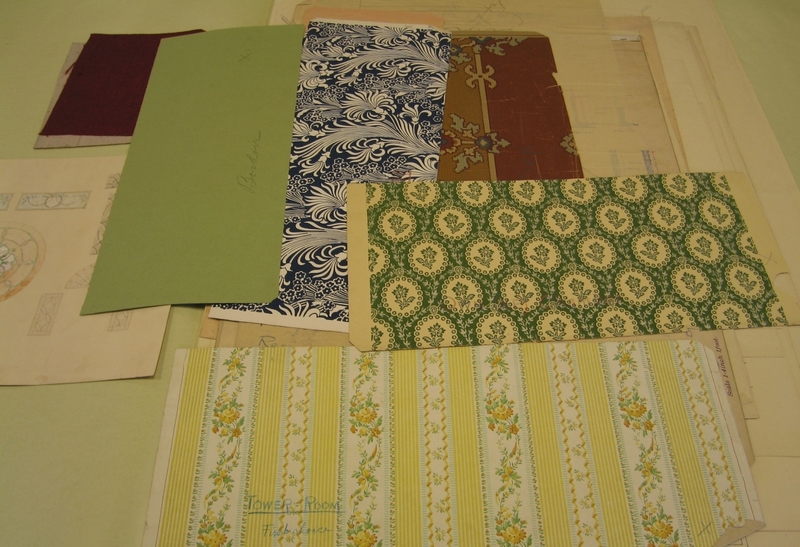 Preservationists trying to determine the original interior appearance of a home would have been delighted to own the Munro-McCabe house: Samples of the original wallpaper were included with the architect’s archived records. Fifth Avenue, formerly called Moline Avenue, was an important residential area at the turn of the century and earlier. Many of our city’s finest mansions were located here between 24th and 30th Streets. The McCabe home, which faced north, was approached by a curving brick driveway which extended under the porte cochere and probably on to the carriage house visible in the background. This house, which is a delicious feast for the eyes, was an advanced design in 1896. It combines elements of the older Queen Anne style with newly popular Classical Revival details. The round tower with its witch’s cap roof and curved-to-fit window glass, the multiple bay windows, and the cross-gabled hip roof are all Queen Anne features. Notice how Stauduhar’s design for the second story window on the far left looks very much like the window he designed for the Kelly House at 1703 20th Street, with a circular window embracing a rectilinear one. Classical Revival elements are seen in the Palladian-inspired attic window – three windows with an arch above the center one –as well as the simple round porch columns, second story balconies, and the triangular pediment above the main entrance. Although the postcard makes the dark red house appear to be brick; fire insurance maps and a closer inspection of the postcard confirm that it is indeed frame clapboard construction. The roof appears to be slate, uncommon in Rock Island. The cupolaed carriage house seems nearly as large as the main house. It would easily have accommodated horses and carriages on the ground floor and hired household staff on the second. Mrs. Marian McCabe and her daughters remained in the home for a time after her husband’s death. After being vacant for a time, their home was purchased by Harry White in the 1930s. During the war years and thereafter, Mr. White and his wife rented furnished rooms. The character of Fifth Avenue began to change, too, with industrial use replacing some of the old homes. Then some of the adjacent homes were demolished to create parking lots. Finally, in 1956, the home was purchased by Iowa-Illinois Gas & Electric Company. Then 2920 Fifth Avenue disappeared. Its large lot site is now part of the large parking lot for Mid American Energy across the street. And samples of glorious wallpapers are safely tucked in a trunk in an attic at the University of Illinois. This article by Diane Oestreich is slightly modified from the original, which appeared in the Rock Island Argus and Moline Dispatch on March 17, 2002.